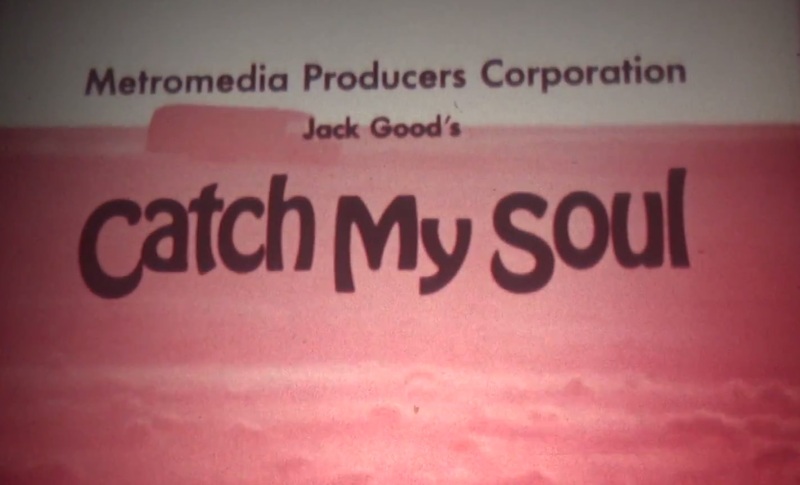 One of the highlights from Monday night and our 8th Birthday Party was the unveiling of a very rare trailer find, an original 60-second 16MM trailer for the very rare film ‘Catch My Soul’, the only feature film directed by Patrick McGoohan and unavailable for many years. This trailer is currently the only way you can see any footage from the film, as although various versions of the film have been found in the past few years, none of them are available to view publicly, so this brief trailer at least allows us to get an idea of what the film looked like. How did we find this trailer? I’d like to say we went on some epic long quest that lead us around the world’s film archives, but it simply popped up for sale on ebay late last year, with a Buy It Now price of $5.99, so we didn’t waste a second and picked it up straight away. The version here is simply filmed from a Steenbeck with my camera, I’m going to look into how much it’ll cost to get it properly transferred from the print,.